There is a lot of talk about the big elections tomorrow, but New Yorkers in the know are looking at what’s on the back of the ballot, the proposals. This is where we can make some directed changes in the good governance of our City and change some of the old, stale culture of New York City politics. For an overview of the ballot process and why this good government reform is needed, check out this video. 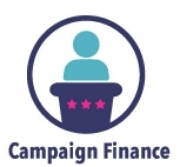 Question #1: Get Big Money out of Politics – This will reduce the limit any single donor can contribute to a candidate and make sure that anyone who gives a small donation sees it multiplied many times over – eight to one. When the people’s small donations reach further and further, working people can run for office and win against corporate sponsored candidates. This isn’t as good as making all paid lobbying illegal, but it’s a step to supporting grass root candidates who are less rich/connected. Click here for more arguments for and against the proposal. 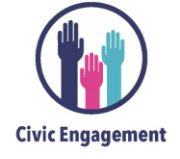 Question #2: Take Participatory Budgeting Citywide – Do you like participatory budgeting? Then you’ll love this proposal to make it citywide. 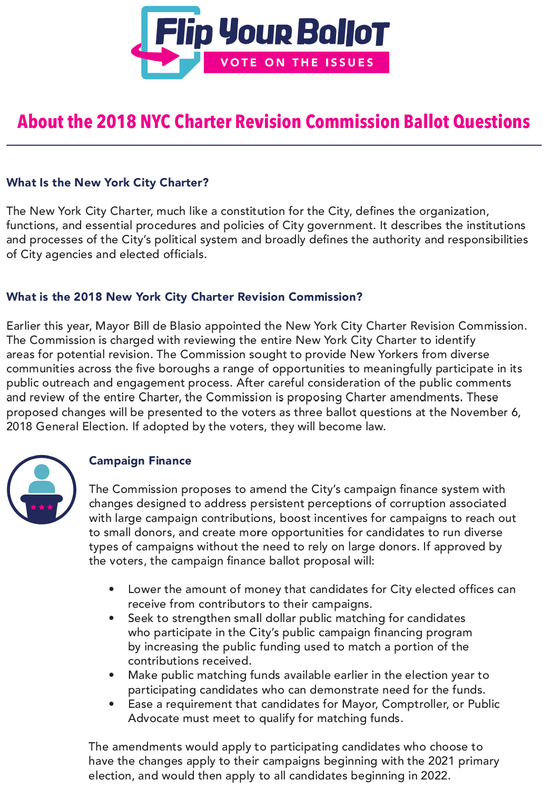 The current process does allow New Yorkers to directly vote on how funds are distributed instead of allowing them to be used for political favors. But the process is still managed by a small group of people who already have enough resources to volunteer, and are decided on by people who have extra time for the special vote. This bias can favor stay at home parents, the elderly, English speakers, and the wealthy. 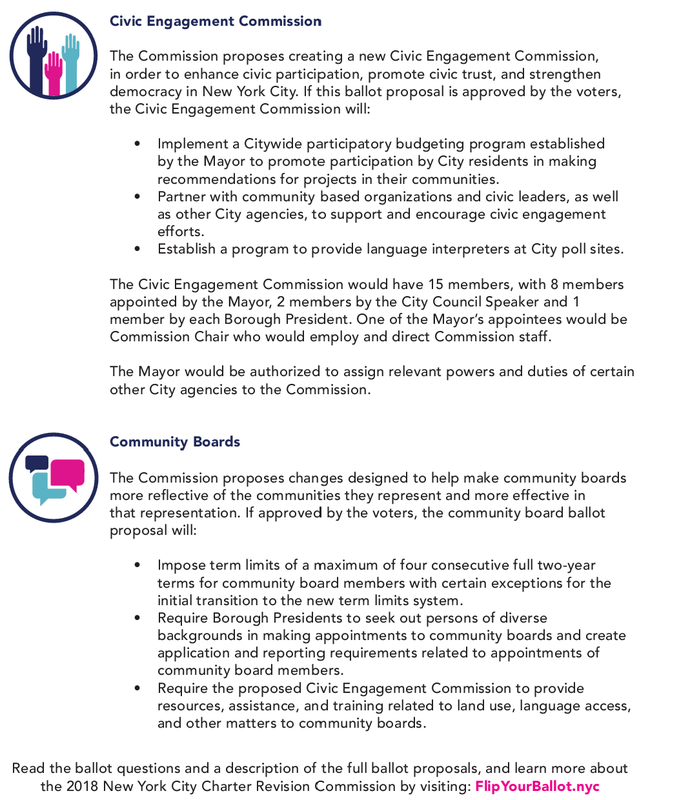 This proposal also created a 15 person commission to support civic activities, including increasing democracy, education community boards, and bringing more interpretation to polling sites. Question #3: Harness New Energy at the Local Level – Community boards currently play an oversized role in our government, vetoing life saving measures for political games. Many people are appointed for decades and there often isn’t a chance for new people to get an opportunity. Community boards should have term limits – like mayors and city council members – so new voices and young people get a chance to participate. 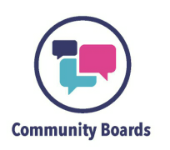 Currently most community boards are hostile places to anyone without political connections and . Although this forced sabbatical doesn’t go nearly far enough to change the culture (CB members can rejoin after a 2 year break), it does put a bump in the road for those who are currently ruling for life. You can also read Streetsblog’s excellent piece to see how the strong bias on Community Boards currently stop life saving street safety measures. Previous Post #FlipYourBallot: Community Board Reform Now! Next Post Question 3 Has Passed! Community Board Reform will Happen in NYC!